I should be getting paid for this. I used to have a clean mouth. I brushed twice daily, rinsed with mint-flavored mouthwash, and liked to think I had fairly fresh breath. I even flossed once in a while (or, if my dentist is reading this, every single day). Unfortunately, that is no longer the case. Next to being able to eat, talk, breath and smile, I’m definitely excited about the idea of being able to attain the pedestal of fresh breath once again. Believe it or not, that 3-step plan is foolproof. First off, once you’re out of bed, it’s not too difficult to just, ya’know, stay out of bed. And second, humankind is unable to contain its desire to dance when The Boys are playing. Instant win. 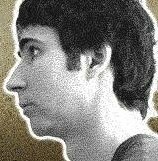 Somebody recently told me I resemble Spenny from the TV show “Kenny vs. Spenny”. This is a substantial improvement over Elmer Fudd and Donald Duck. My neighbors from upstairs have started passing me health products during our stairwell encounters. So far, I’m the proud recipient of hemp seeds and some exotic berries that grow on Vancouver Island. I’m not sure how credible these supplements are, but they taste delicious in my smoothies, so I have no complaints and I appreciate all the kind gestures they’ve extended my way thus far. I’m almost ready to commit to saying I have a 0/10 pain factor. Activities like talking and sleeping are becoming less of a nuisance each and every day. I must admit, I’ve been incredibly blessed throughout the first month of my recovery. Not only have people been bringing me different meals to try out and suggesting items to blend to my heart’s content, but I also haven’t become sick at all during this ordeal. That’s pretty amazing, considering I haven’t been eating very much or getting enough sleep. I heard horror stories of people throwing up with their mouth wired shut. I’m thankful I’m not one of them. To wrap this up, I walked into a door this morning. Not on purpose. Not in an attempt to be funny. I plain and simple walked straight into a door. You see, at work, the door that opens into the stairwell from the parkade is always slightly ajar so the people currently working on our new testing lab can get in and out without needing a keycard. Apparently that’s no longer a problem though, seeing as how the door in question was shut this morning. Quite firmly, I might add. Go figure. You’re from Canada, right? I’m in Edmonton and so glad that I got this done in winter so I don’t feel like I’m missing out on much outside my apartment besides snow and cold, lol. I’d hate to do this if it were sunny and beautiful out! First, thank you for putting this blog together and maintaining it for the last two years. It’s got to be tedious after awhile. I am on day 30 and had very similar surgery to Christine’s. Although I’m not sure if she mentioned that her palate was widened. Mine was slightly bit I didn’t need a splint nor did I need bands/wires. I also had the gummy smile fixed. I can relate to everything Christine said about her swelling and how her smile looks like a grimmace. My nose doesn’t stick out more it just looks higher up on my face. I’m hoping its just the swelling and still being frozen in that area that are the contributing factors. My surgeon assured me that I will love my face in another month to two. I definitely don’t dig it right now! The most annoying thing is the numbness in my palate and the way my upper jaw feels–like its suctioned on! Weird! Anyway, thanks again. I enjoy reading your daily posts. Just hilarious! Best regards. 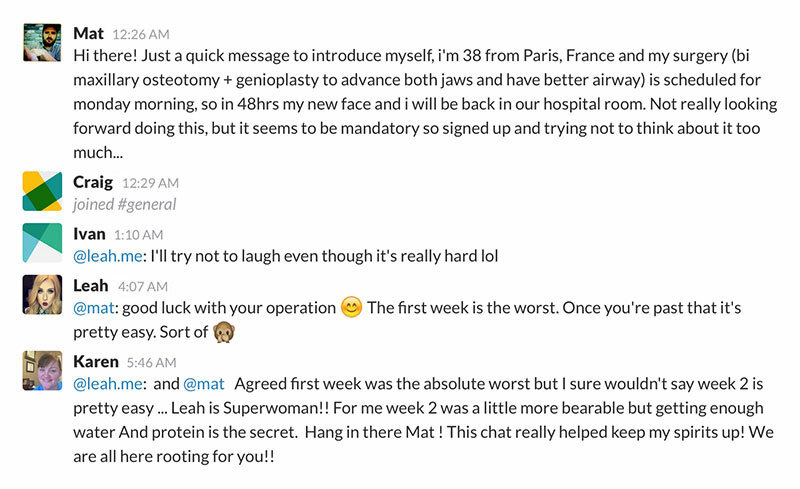 Margot, I’m happy to hear this blog gives you something to chuckle at during your recovery! I know what you mean about the lack of feeling being frustrating, but it should come back over the next month or so. Stay happy and this will all be in the past soon! Enjoying your blog – wish I’d read it before surgery! I’m on day 29. Do you remember if your nose seemed to stick out more? Because I ain’t likin’ this look. Most of my swelling is gone, except for this stubborn bit on my upper cheeks next to my nose and my upper lip. I’m really hoping I get my old nose back b/c I kinda look like a dog right now. Did you feel like you had a recessive chin post-op? The surgeon tilted and levelled the top jaw and rotated my lower jaw a bit to the right (repairing damage from a huge ski accident in my teens – the 3rd surgery to get patched up) and didn’t take any bone out of the lower jaw, but it sure looks recessive to me. Also, did your smile look more like a grimace post-surgery…how long does that last? It’s the first time in my life that I actually look the best when I let my jaw hang loose! Sorry if you already covered this in your blog – I’ve read a number of posts but not all – – yet. It is SO good to read posts from people going through the same thing. I was definitely not happy with my look post-op, but it was a matter of swelling and adjusting to my new image. After 3 months, the swelling should be entirely gone, so you’ll see the true shape of your face (and your smile will change as well). As for your nose and chin, you just have to get used to the new shape of your face. Remember that you are your own worst critic because you see yourself in the mirror several times each day. Ask your friends what they honestly think. They’ll likely tell you that “you look different, but better” (as mine did). I believe I was using mouthwash at around a month’s time, yes. You should ask your surgeon, though, because if your stitches have been pulling out at all, it may irritate your mouth more than help it. 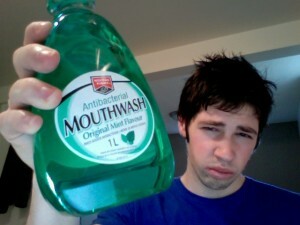 So, the mouthwash you’re holding in the photo, were you using it at day 29? I finished off my bottle of Peridex and forgot to ask my surgeon if I can use regular mouthwash now? So I’ve been sticking to using my Waterpik but my mouth is beginning to taste a little strange, particularly my tongue! Haha, you’re right, that’s a crucial detail that I clearly overlooked. Next time I quote such an esteemed character, I’ll be sure to use the proper combination of capital and lowercase letters. Oh Piggy, hes a great guy to quote now isn’t he? I think the capitilized vs non-capitalized o’s makes a substantial difference on the entire mood.